If you read my last post about light, you know that light of all kinds (visible and invisible) is produced when things with an electric charge (like electrons) are jiggled. Today the science blogs and even the ordinary news websites are abuzz with the announcement that researchers with an experiment called BICEP2 (what a great name!) have detected gravitational waves in the microwave radiation left over from the Big Bang. Deep, exciting, but still somewhat preliminary, this is a discovery worth watching. It could settle once and for all whether cosmic inflation really happened and may even give us insight into whether or not we live in a multiverse. So what in the world are gravitational waves, and what, if anything, do they have to do with light? We notice gravity every day when we stand up, jump, or try to keep our meatballs from rolling off our plate. Mmm, meatballs. This is because we live on Earth, and Earth has a lot of mass. But everything, not just things with a lot of mass, produces a gravitational pull. It’s just that, for most things, the pull of gravity is incredibly small. Yet even this small pull has been measured. In 1797-98, English scientist Henry Cavendish measured the gravitational force between two heavy balls. His experiment was so sensitive that Cavendish had to observe it from far away, ensuring that his own movements wouldn’t disturb the delicate equipment. A telescope focused on the apparatus led out of Cavendish’s basement laboratory and to the enraptured scientist stationed far away. He watched as the two balls oh so delicately pulled toward one another. Cavendish had just measured the strength of gravity. 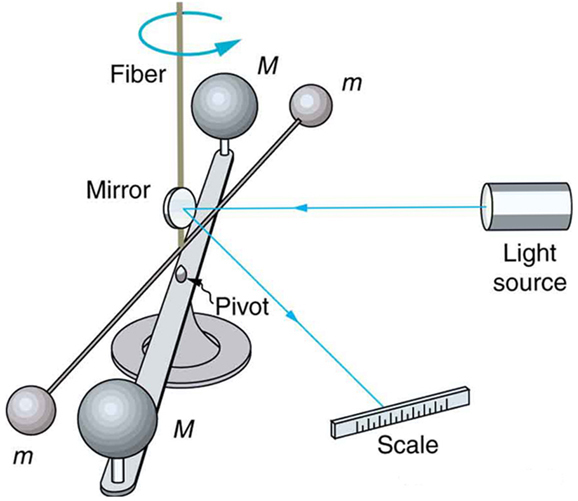 A modern version of Cavendish’s experiment, using a light source and a mirror to measure the gravitational pull between the larger balls, M, and the smaller, m.
Cavendish’s experiment helped us know the value of the gravitational constant, G, that appears in Newton’s equation for gravity. G plays the same role in Newton’s gravity equation that ε0 and µ0 play in the equations for electric and magnetic fields. Just as Maxwell’s manipulations showed that electromagnetic waves (i.e. light, both invisible and visible) moved through space with a particular speed c, Albert Einstein’s work with gravity showed that it, too, moved through space with a particular speed. What is that speed? Amazingly, it is that same value c, the speed of light (and, as it turns out, gravitational waves). Einstein’s work showed that, just as jiggling an electron up and down produced electromagnetic waves, jiggling any massive object up and down produces gravitational waves. The catch is that gravitational waves are so incredibly weak that they are extremely difficult to detect. While the BICEP2 data is not what most scientists would call a direct detection of gravitational waves, it is (if it holds up) excellent evidence for their existence. However, despite what some web stories are claiming, this is not the first indirect gravitational wave detection in history. In 1974, Joseph Taylor and Russell Hulse, using data collected from the Arecibo radio telescope in Puerto Rico, found two neutron stars traveling about one another in tight, fast orbits. These neutron stars are so massive, and are orbiting so quickly, that they produce copious gravitational waves. The diagram shows how the two neutron stars in the Taylor-Hulse system lose energy to gravitational radiation as they orbit one another. Just like light waves, gravitational waves carry away energy. That energy has to come from somewhere; Einstein’s theory showed that the energy for gravitational waves produced by two such orbiting bodies must come from their orbital energy, causing the bodies to move toward one another and spin even faster (a bit like water getting faster as it spins down a drain). Taylor and Hulse were able to measure this changing rotation rate, and it matched Einstein’s prediction beautifully. While they hadn’t detected gravitational waves directly, Taylor and Hulse had shown that the orbiting neutron stars behaved exactly as if gravitational waves were real. 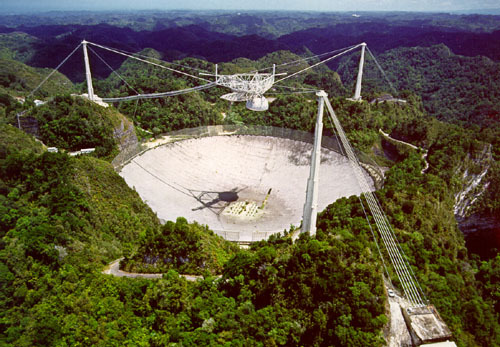 The lovely and impressive Arecibo radio telescope, where Hulse and Taylor made their observations. There’s a beautiful symmetry between the behavior of electromagnetic waves and gravitational waves. Both are, in an important way, properties of the fabric of spacetime – both are something the universe does. 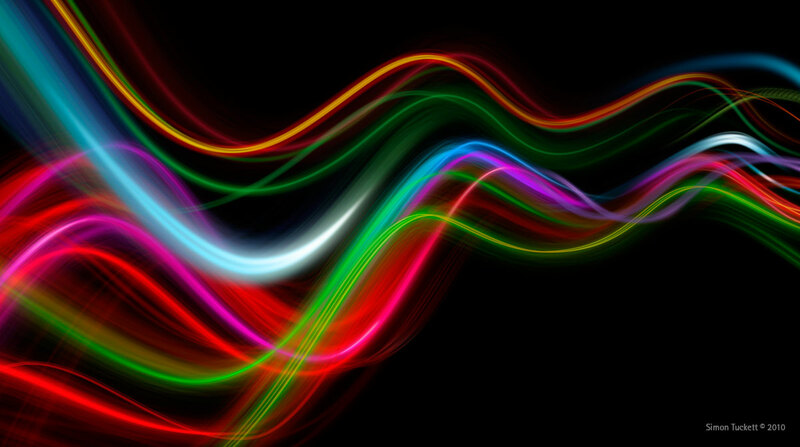 Both move at a particular speed, c. Both come in “colors” determined by their frequency. And, crucially, both give us a window to understand the universe. When new kinds of electromagnetic waves beyond visible light were discovered, they revolutionized our understanding. Radio light, infrared light, ultraviolet light, x-ray light, and gamma ray light all gave us new insights when they were collected from the sky, including discoveries of pulsars (neutron stars), quasars, black holes, gamma ray bursts, and the cosmic microwave radiation itself. If and when we’re able to not just infer but in fact detect and study gravitational waves, we’ll have an entirely new way of “seeing” the universe. Who knows what discoveries await? Light is something the universe does. I wanted to use that statement in an article I wrote a long time ago, but the editor didn’t allow it. What ever could I have meant by such an odd statement? Just this. Light is ubiquitous. We know what happens when we enter a dark room and flip on a light switch. Suddenly (and it does seem to be sudden) objects in the room become visible. A flashlight can do something similar, and we can even direct the beam of the flashlight at particular objects and not at others. I remember being puzzled by the car’s rearview mirror. I’d ask an adult what the mirror was for and learn that it gave a view behind and outside the car. Not from my vantage point, though. Apparently the light entering another’s eyes could be different than the light entering my own. I also remember standing outside on a warm summer day, feeling the heat of the Sun on my face, my hands, my back. Light bulbs that had been on were hot to the touch, and a crayon positioned under a lamp would melt into a waxy puddle. Light could do things. Another early memory is of my dad building for me an electromagnet from a battery and some wire. Pressing on the wire over the battery brought the wire into contact with the button at the top, completing the circuit and allowing the whole thing to pick up paper clips, screws, and so on. How was it that completing a circuit could turn wire and a battery into a magnet? What I didn’t know was that every time I completed that circuit, I was sending electrons streaming along the wire, and those electrons were sniffing out the space all around. The way that electrons sniff involves spreading electric (if the electrons are still) or both electric and magnetic (if the electrons are moving) fields, and the ability to sniff in a particular medium (air, say, or water, or rubber, or anything else in the space) is called the permittivity (for electric fields) or permeability (for magnetic fields) of the medium. (Note that magnetic fields are about electric current I, while electric fields are about electric charge q, indicating that it’s moving electrons that cause magnetic effects). What does all this have to do with light? Just this. Around 1861 Scottish physicist James Clerk (pronounced “Clark”) Maxwell was fiddling around with the equations for electric and magnetic fields. What happened next changed our understanding of the universe forever. Maxwell found that his equations predicted that electric and magnetic fields could propagate through empty space, one producing the other on and on. That propagation would take the form of a varying electric and magnetic field moving in a particular direction. The speed of that propagation came out as a constant number, dependent only on the electric and magnetic constants ε0 and µ0. Even more amazing, though, was the number Maxwell got when he plugged those numbers into the equation. The value of c came out suspiciously close to the measured value for the speed of light! Put the equations of electricity and magnetism together, and the speed of light comes flying out of your math, unbidden and unexpected, but undeniably there. We now know that any time electrons jiggle, whether it’s in the radio transmitter of your cell phone, in the awesome accelerated motion of an x-ray machine, or even in the hot filament of a flashlight, the result is light. Some of that light you can see, like a small portion of the light from a hot light bulb filament. Much of it you can’t see, like the radio light flying away from your cell phone or the x-ray light bouncing off your dental fillings, or the infrared light that does much of the work in heating your face in the Sun or your crayons under a lamp. Yet every bit of it is light, an electrical and magnetic vibration in the very fabric of the universe.